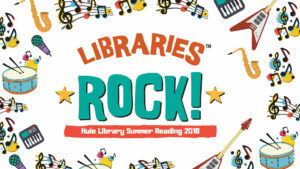 This summer reading theme is “Libraries Rock!” The programs will explore topics such as music education, geology, and more. These programs are free and open to children ages 6-12 of all abilities and located in the second floor classroom of Huie. Each event will be from 2-3 PM. Tuesday, June 12 – Zumba with Fernanda! Tuesday, July 31 – End of Summer Reading PARTY! In addition to children’s events, adults can log and review all the books they read or listen to between June 4 and August 4 here. Extra entries will be given for books read off of the Great American Read list for more information on that list we have a LibGuide. There will be randomly drawn prizes and a prize for most books read. There will be Any Book – Book Club lunchtime events for adults at noon in the library classroom on June 27 and July 25. For more information, call Huie Library at 870-230-5258.